So you’ve decided to take your family out on a trip in the wilderness. Great, but are you prepared? There’s plenty of stuff you are going to need, such as a good camping knife, a proper backpack, plenty of other smaller items, and if you really want a unique, complete experience, you’ll need a family tent. So we are here today to discuss what makes the best family tents, which tents are better than others, and which model will suit your purposes – some tents are for smaller families, others can provide shelter for up to 10 people, so if you want to find out more, make sure to stick around to find out. The full reviews can be found in the section below. You can make use of the comparison table to get a quick overview regarding our top picks and our verdicts in turn. Let’s open up our review of the best family tents with Coleman’s Weather Master 10-person outdoor tent. Basically, the Weather Master 10 is a big, spacious tent which offers plenty of room, enough for about three quen sized air beds. 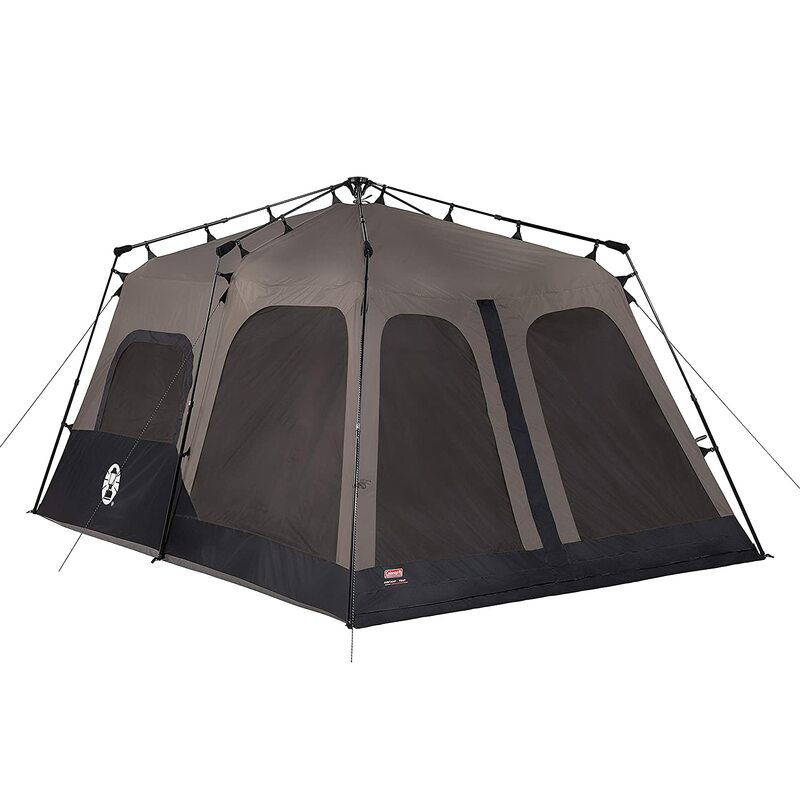 This tent utilizes the Weather Tec system which rocks excellent ventilation, making it suitable for all-weather use. You’ll be able to easily enter and exit as you see fit since there’s a convenient hinged door at the front. What’s more, the setup is a breeze, and you won’t need more than mere 20 minutes to complete the entire process. Now, what makes the Weather Master 10 so good is the Polyester taffeta material it’s made of. This particular material provides plenty of durability which is almost completely impervious to scratching and ripping. Great for up to two families (or up to 10 people), the Weather Master is a perfect solution for almost any kind of camping or outdoor activity, but it has its flaws too. Namely, this tent is quite heavy, weighing approximately 31 pounds. That shouldn’t be considered as a deal breaker though, since it’s as big as they make them. In essence, this is our best 10 person tent pick – you’ll have a tough time finding a better model within the price range. Next up on our list of the best family tents is Mountain Trails’ Grand Pass 10 person tent. This is our “great dome tent” which means that it will provide you with a reliable roof over your head with the least amount of effort possible. The frame is comprises of shock-corded fiberglass and rocks pin-and-ring system which substantially simplifies the setup process. It’s fairly easy to set up as you’ll get all the necessary parts with the bundle – it took us approximately 15 minutes to get it up and “running”. What’s more, it’s a bit lighter than Coleman’s Weather Master 10 as its construction is comprised of nylon materials for the most part. 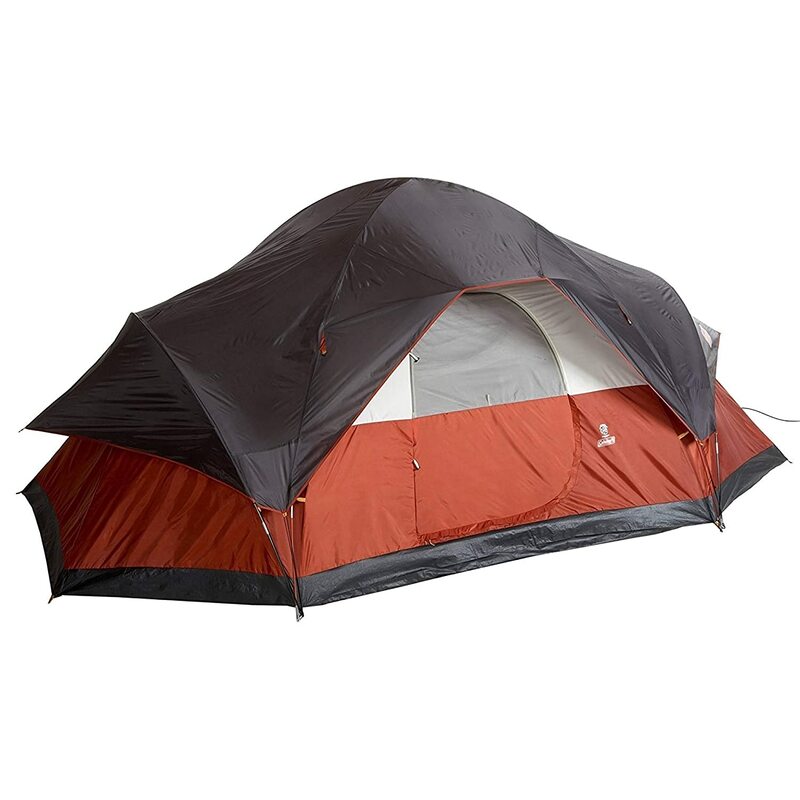 That, however, also means that this tent is slightly less durable, but it’s quite robust nevertheless. Now, the main difference between the aforementioned tents is that the WeatherMaster is more cabin-like in design while the Mountain Trails’ Grand Pass is more of a dome – they’re both spacious, but they look strikingly different. On top of that, there are 2 large doors onboard (as opposed to Weather Master’s one), so entering and exiting it will be a piece of cake. Oh, we forgot to mention that this tent costs (approximately) only half as much as Weather Master 10. We’re moving on to the best cabin tent available for the money – yes, we’re talking about Ozark’s Trail family cabin tent. 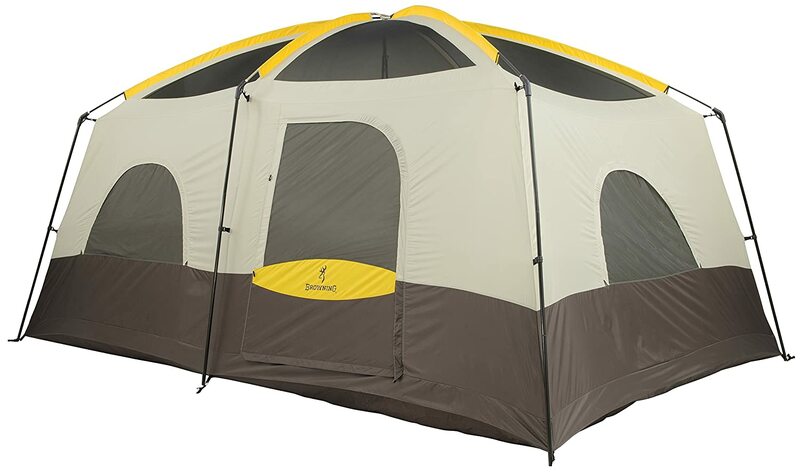 Although it comes from an underdog brand, this tent packs a major punch for the buck – it’s available in a plethora of color options, and it offers plenty of room for at least two families. It sports a huge dome covered with a convenient rain flap, and the majority of the construction is entirely waterproof. Needless to say, you won’t have to pack it up and go home if you get hit by unfavorable weather. There’s one door at the center and two at the sides, which basically translate to more privacy and convenience. You’ll be able to fit in at least three queen size air mats while still having some room on top of it. You’ll also get two room dividers (which are easily removable in case you don’t need them), which totals in three completely separate rooms. The only bad thing about this camping cabin is that it costs quite a lot, but it brings a lot of benefits onboard – plenty of space, the durability it provides is great, and the room dividers allow two families (or more) to keep their privacy while sleeping under the same roof. It’s important to think ahead, as rainy days can come quite unpredictable with intent to ruin your camping trip. 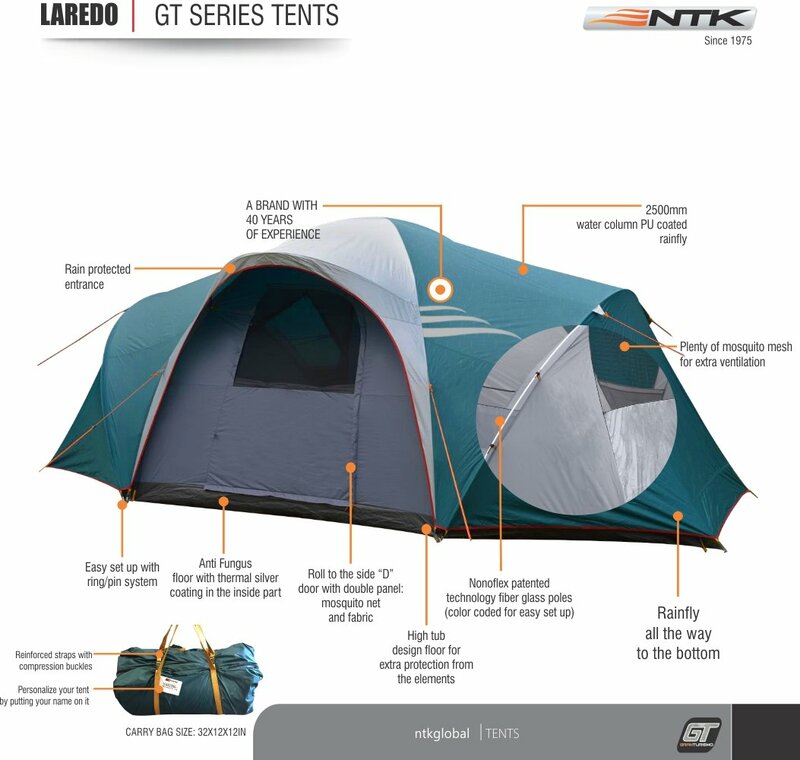 That’s why we’re recommending to your our best waterproof tent pick, the NTK’s Laredo GT waterproof camping tent. In essence, this is a big tent which can provide leisure and comfort for up to 8 or 9 people, although there would be no problems if you invited a tenth friend. The doors are very big and there are three windows from which you can enjoy the view. In fact, we could easily label this camping tent as the most convenient one too – it sports a nano-flex shock-corded rods and a fully functional mosquito mesh. These pests are on top of the list of “things that can ruin your camping trip”, so you can scratch them and the “rain” out. The frame is excellent and durable, but the floor is what makes this tent so great – it boasts heavy duty polyethylene materials with anti-fungus properties. Needless to say, you will feel as if you were on an actual (cosy and comfortable) carpet, not a tent. On the downside, the Laredo GT costs quite a lot in comparison to our previous pick, but it’s worth every cent nevertheless. We’ve seen some big tents so far, but none can compare to Core’s 10 Person Straight Wall cabin. 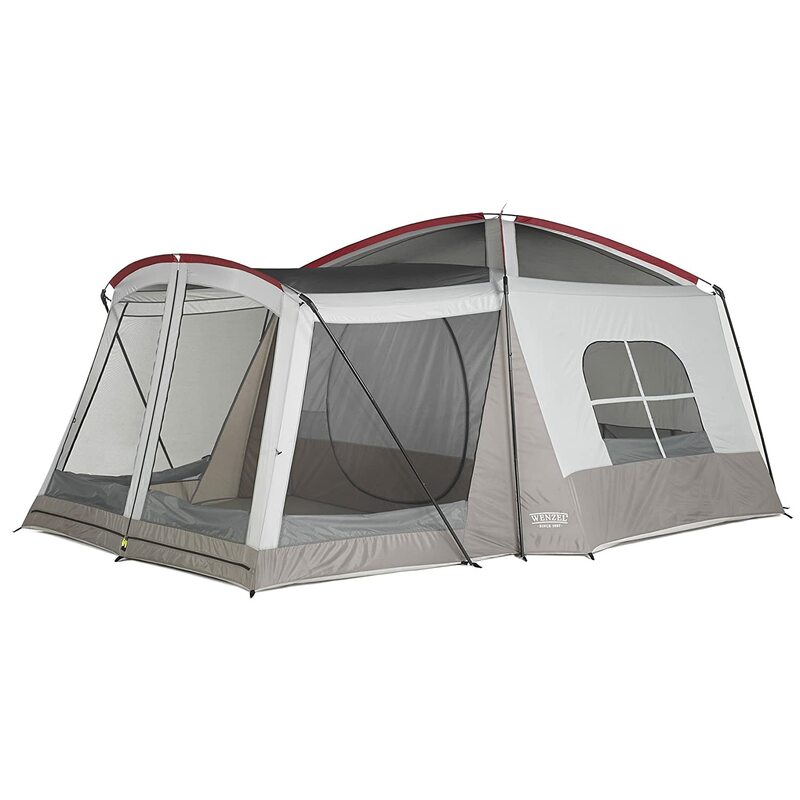 This particular model is, by far, the largest cabin tent available for the money. It can accommodate up to 10 people, but it shouldn’t be confused with some of our earlier picks – these ten people could actually feel very comfortable and cosy while sleeping inside. Core’s Straight Wall cabin utilizes their patented H20 block tech which makes virtually every single part of the tent water and splashproof. Apart from being huge, the Straight Wall is easy to setup and come with a plethora of convenient parts, such as the rain fly, a gear loft, a room divider, several tent stakes, and a gratis carry bag. On top of all, it’s not even that expensive. Remember Coleman? Their Weather Master was our first pick, and now we’re reviewing their 8-person tent – a bit smaller variant of one of the greatest family tents on the market. This model is best for beginner campers as it’s easiest to setup. First of all, Coleman’s 8-person Instant Family Tent is made of 150 Denier material – it’s fairly sturdy and will survive a cut or two, not to mention the harsh weather or some heavy rain. It’s also pretty big and can provide shelter for up to 8 people at the time. That should be enough for at least two queen sized beds or three smaller ones. Let’s talk a bit about Coleman’s exquisite technologies, shall we? Namely, this band uses the WeatherTec system in nearly all of their models, and this one is not an exception. It means that the flooring of a Coleman tent is sturdy, comfortable, and completely waterproof. The only downfall is that the zipper tends to get stuck at times, but it’s pretty great overall. Here we’re looking at yet another camping tent from Coleman. This time we’ve taken a gander at the big Red Canyon Tent – an 8-person family tent which sports premium-quality features and easy setup. You surely remember the Coleman’s unique WeatherTec system, so you could’ve already deduced that they make high-quality floors for their tents. Let’s see what else they’ve laid in store. This camping tent comes outfitted with several room dividers which allow you to divide the tent in two to three separate sections. On top of that, it’s big enough to provide a roof for eight people, perhaps even nine if kids are present. Additionally, Coleman engineers used new, innovative technologies when they made the Red Canyon – the Cool-Air port, as well as the Variflo venting system provide impeccable ventilation, making the sleeping part a bit more comfortable than what you’re used to. Last, but certainly not least, the Red Canyon is very, very cheap and it packs a huge value for the cash. This is the first “glamping” tent in our review, and if you’re not familiar with the term, “glamping” is basically camping with style. If you’re out there searching for a family tent which could help you recreate the feeling of warmth and comfort your own home provides, then Browning’s Big Horn is absolutely perfect for you. 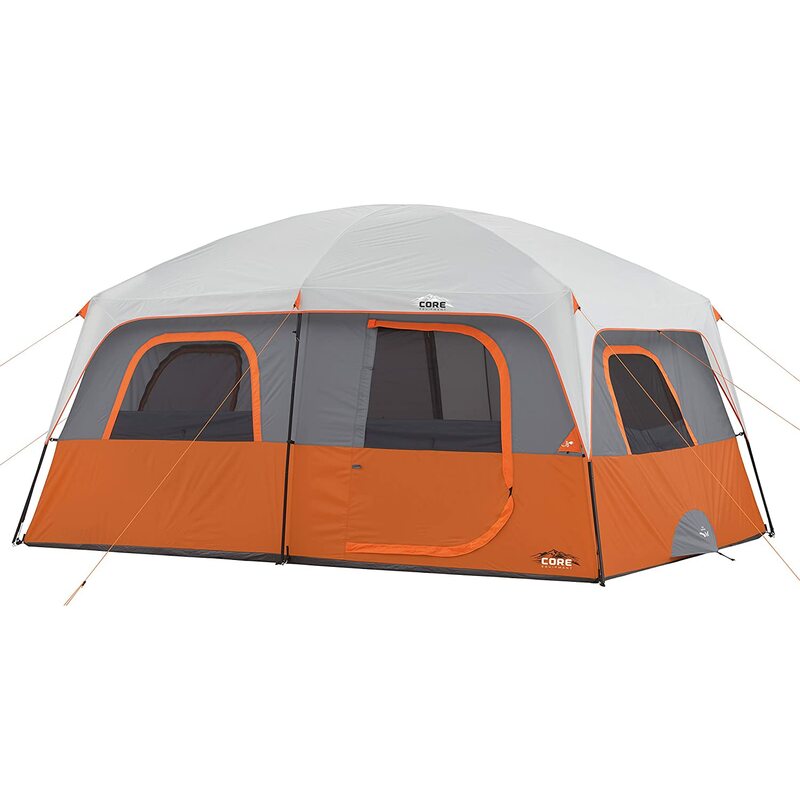 Before we get any further, we should mention that this camping tent is fairly expensive, and it costs more than all of the models we’ve seen so far. Nevertheless, it sports premium quality facilities and a huge interior. The poles are made of exceptionally durable fiberglass and provide impeccable support while the free standing design with a tall center make the interior a bit more hospitable. There’s a total of six windows, as well as two huge doorways for easier access, but what we really want to highlight here is that the ventilation is absolutely fantastic. Easy setup and plenty of room are the least you should expect. Like we mentioned earlier, the only downside is that this tent costs quite a bit, but it’s well worth the money. Though it’s true that winter has just started, it’s always a right time to start preparing for the summer season. 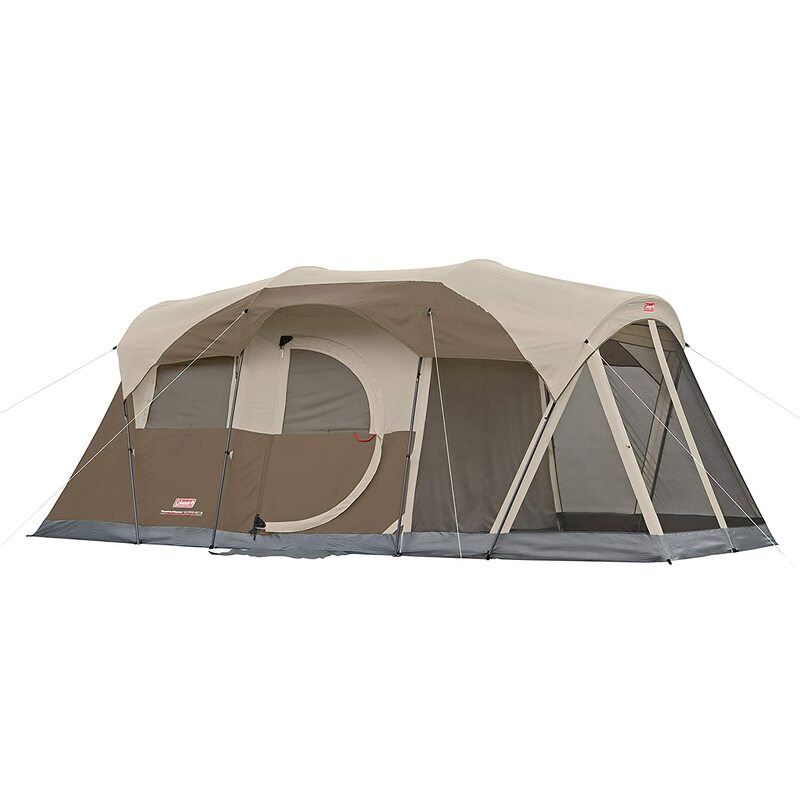 If you are looking for the best summer tent on the market, Wenzel’s 8 Person Klondike tent is your best option. This tent is available in three color options, it’s intended for eight people, and it’s made of premium quality weather repellent polyester material, coated with an additional layer of polyurethane. A portion of the interior is screened, making it ideal for sunbathing or relaxing. It does weigh quite a lot (27 pounds), but it’s very convenient and spacious, and that’s a major understatement. Now, the roof is, perhaps, the greatest benefit this tent provides – it’s entirely made of mesh fabric materials and it sports waterproof properties. Again we’re reviewing a Coleman’s tent, this time it’s one best suited for up to six people. That being said, if you’re in the market for a smaller tent, the Weather Master 6 is absolutely perfect for you. Though smaller than Weather Master 8 and 10, the Weather Master 6 is pretty spacious in comparison to similar models within the price range. What’s more, it just happens to be one of the so called “Amazon’s Choices” due to its premium quality. The interior of Weather Master 6 can hold up to two queen sized air beds at best. Although we’ve mentioned this twice already, Coleman uses the WeatherTec technology to reinforce the flooring against water and bacteria. There’s a convenient hinged door at the centre, and the windows are angled so as to prevent the rain from entering. Speaking of rain, the construction of this tent is waterproof, and there’s a rain flap on the roof. Setup is easy just like with all Coleman tents, and we needed some 2 minutes to assemble it, although you’ll probably need even less. 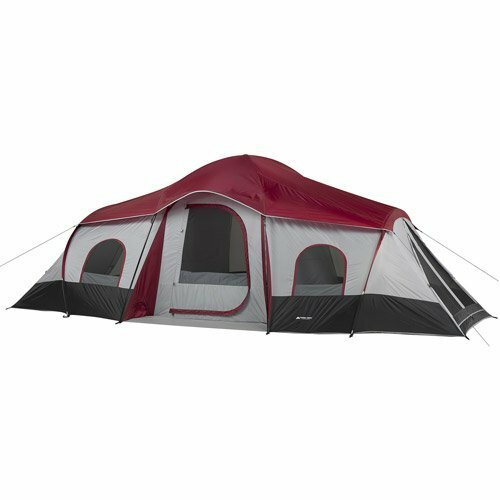 In essence, this is a neat, high value tent for up to six people. 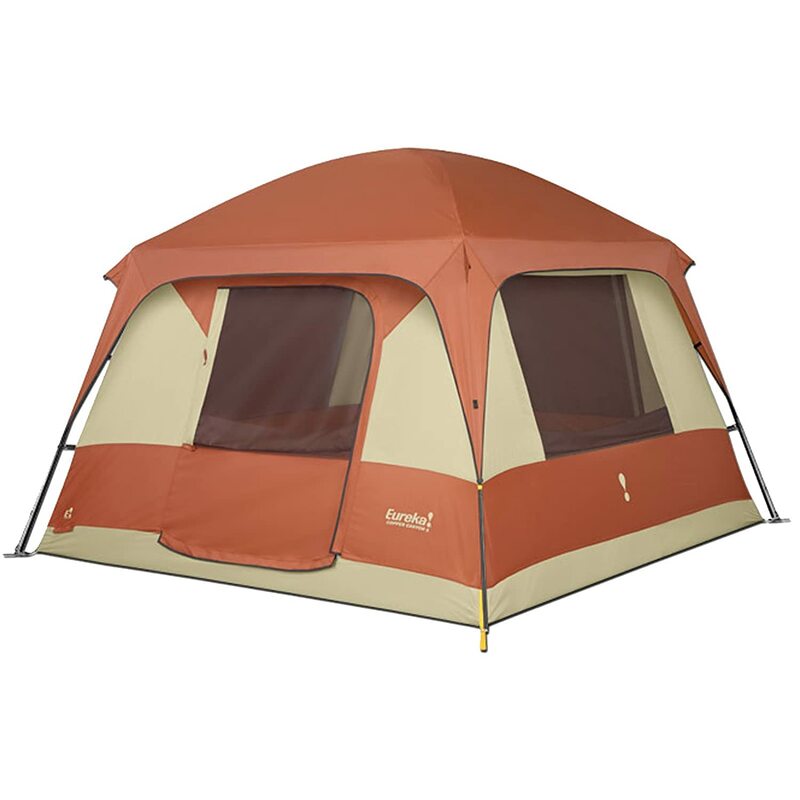 We’re closing the curtain down with our honorable mention – the best small family tent we’ve picked for you is Eureka’s Copper Canyon. This model is strikingly smaller than any tent we’ve reviewed so far, but there are people who don’t need the spaciousness of Coleman’s WeatherMaster, for example. If you are one of them, than we think that Copper Canyon will be ideal for you. Essentially, this is a 6-pole cabin-style tent which boasts plenty of floor space, enough for up to six people. The freestanding design complemented with steel and fiberglass frame make the assembly process rather simple. There’s a window at each side which provide plenty of visibility and superior ventilation. The roof is made of full mesh materials, further boosting the ventilation while reducing condensation all the while. 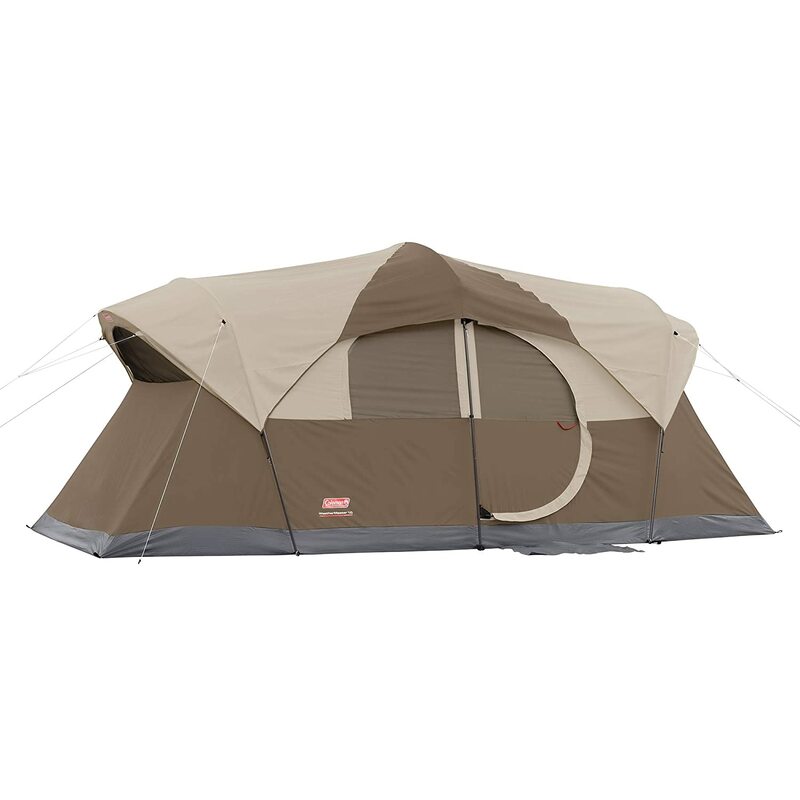 The only bad thing about Copper Canyon is that it’s quite expensive for a 4-person tent. Namely, it costs as much as a regular 8-person dome, but its superior to most similar products in terms of durability and functionality. Buying Guide: How to pick the best family tent? We’ve seen what some of the best family tents are, but to a laymen they might all look the same, or at least very similar. That’s, however, not the case – it’s more likely that you need the knowledge required to pick a good tent and differ it from an “okay” one. This section should help you do just that, so without any further ado, let’s get straight to it. Let’s face it – if your tent rips while you’re outdoors, the least you should expect is the rain coming in, air drafts, and bugs, and that’s just the beginning of it. There are all kinds of things that could damage your family tent, starting with plain mistakes (such as accidentally dropping a sharp object on it for example) to severe weather conditions. A durable tent, of course, should be able to survive both extremes. Now, the question arises – how to pick a durable tent? Basically, most manufacturers use variations of nylon and polyester when making their tents. Usually, that’s a good thing, but you’ll be absolutely certain that your tent is robust if it’s made by some of the more exquisite materials, such as Polyester taffeta, or such. This one is plain math – the bigger the tent is, the harder it is to setup, the heavier it is, and usually more expensive. These are just some of the reasons why you should decide on how big a tent you need before you even begin your search – for instance, if your family counts three members but you usually take trips with your uncle and his two kids, a 5-person tent is ideal, whereas an 8-person tent would be an overkill. Setting up a family tent is a family activity – everyone gets to participate in one way or another. However, setting up a tent is no small task, and depending on the model you like, it might be hard, ultra hard, or in some cases even impossible. Certain tents are very easy to assemble while some models require a decent level of strength, even some special tools in some cases. For all it’s worth, try to pick out a tent that you know that you can assemble on your own, else you’ll end up sleeping on it, rather than in it. A weather-resistant tent should sport several properties – it should have a good floor that won’t let the insects in, it should be made of waterproof materials (or at least have a flap which will direct the rain downward), and it should have proper ventilation. For example, if you intend to go out camping during the summer, you’ll need good ventilation. On another hand, camping in bad weather conditions requires good insulation. Pick in accord to your needs. That concludes our list of the best family tents, we hoped you liked our picks! Finding the best model for the buck shouldn’t be too hard once you’ve read through our buying guide, but in case you still feel insecure, you can browse through our selection of the finest tents on the market. There’s something for everyone – big tents, small ones, models with good domes, and the ones that are easy to assemble. PreviousPrevious post:What are Hunting Trophies?NextNext post:How to Be Mentally Prepared for Outdoor Trips?